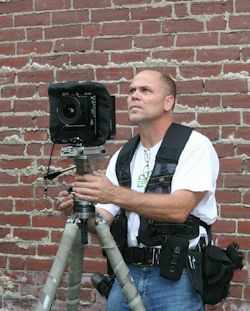 Rob Tucher founded Rob Tucher Photographic Documentation in 1979 when he graduated from Rutgers, the State University of New Jersey. He did his first Historic American Buildings Survey of the Swift/Sioux Pork Meat Packing Plant in Jersey City, New Jersey in 1983, followed only a few months later by his first Historic American Engineering Record of the Holyoke Bridge, a nine-span truss bridge over the Connecticut River stretching between Holyoke and South Hadley, Massachusetts. Since then, he's improved his admittedly then-fledgling craft exponentially and has built a huge collection of archival black and white large-format images of historic structures and landscapes. He has recorded literally hundreds of subjects ranging from the White House to the Naval Hospital, Philadelphia, from the USS Nautilus submarine to the North and South Bergen Railroad Tunnels and Vent Shafts in Jersey City, New Jersey, and from view sheds in the Monument Corridor in Washington, DC to the Casa Malpais catacombs and rock art in Springerville, Arizona, which he has produced to the exacting standards of the Historic American Buildings Survey (HABS), the Historic American Engineering Record (HAER), and the Historic American Landscape Survey (HALS, added to the Library of Congress collections in 2010) respectively. Rob has crossed the country recording historic structures, from Maine to southern California, Florida to the State of Washington, as well as the District of Columbia, Puerto Rico, and Hawaii. Much of his work has been directed to the Prints and Photographs Division (Architecture, Design, and Engineering Collections) of the Library of Congress in Washington, DC. In addition, Rob has completed hundreds of documents to HABS/HAER/HALS Standards of every conceivable type of historic structure for state-level repositories. 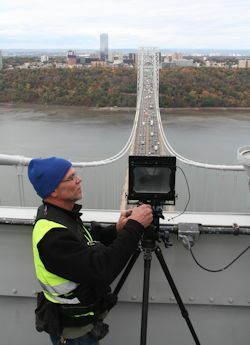 He applies this considerable experience in classical architecture and engineering, coupled with a Certificate in Historic Preservation (Drew University, 1999, Madison, New Jersey), to all photographic assignments. The photographer meets the Secretary of the Interior's Professional Qualification Standards (48 FR 44716, Sept. 1983) for Historic Architecture and has years of experience working as an architectural historian.